Railway Group D Admit Card 2018: Railway Recruitment Board Group D posts admit card is likely to reveal in the month of September. Candidates who have applied for the examination they have to collect their Railway Group D Online Admit Card 2018 from the official website of Railway Recruitment Board. As per the information handout, admit card will be revealed 2-3 weeks before the examination. Candidates will be informed regarding the same through an official intimation. Other essential details such as examination center, and steps to download the admit card, Railway Group D Exam Date 2018 details are covered in below section. (रेलवे समूह डी परीक्षा प्रवेश पत्र): Railway Recruitment Cell (RCC), Group D Admit card will be published on its official site. Applicants who applied for the recruitment before the last date, only these candidates RRC Group D Exam Admit Card 2018 will be published. Candidates are required to carry the same admit card on the day of examination along with other documents. Usually, other documents that are checked at the examination center are an Identity card, and Photograph. Admit Card is a crucial document from an examination perspective. Usually, candidates, who appear for the examination without admit card they are not allowed to appear for the examination. Thus, it is very mandatory to carry the exact documents and Railway Group D Admit Card 2018 at the examination center as specified in the instructions section of the admit card. The examination dates for Railway Recruitment Group D examination are not yet announced. The exact examination date of Computer Based Test (CBT) will be specified on the call letter. As per the Official notification examination of Group D posts will take place in the month of April and May. 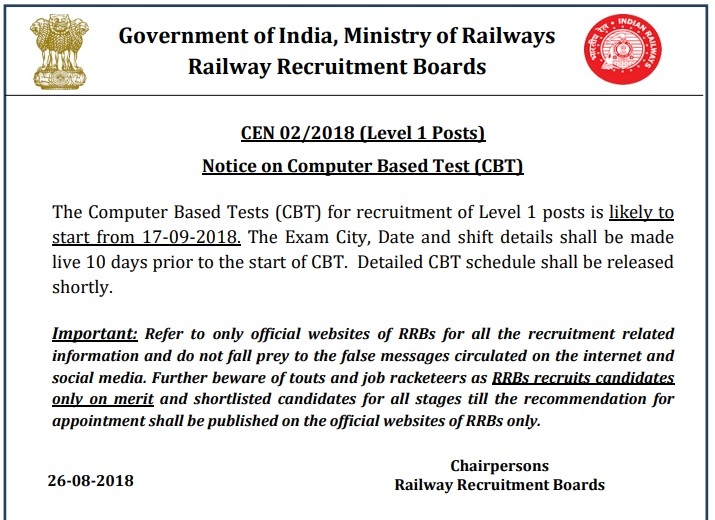 Candidates who are preparing for the examination will notify you the exact RRB Group D Examination Date 2018 as soon as we will get any information regarding the same. The RRB Board Group D examinations will be organized zone wise and candidates will be called for the examination at venues which are specified in the official notification. Generally, candidates get the examination venues as per their choice or that which is selected at the time of registration. However, for personal convenience, RRB Board doesn’t change the examination center. Therefore to reach the examination center on time, it is very necessary that you should download your Railway Group D Admit Card 2018 beforehand. To get the exam dates and admit card at the earliest stay connected with this page.